ST JOHN'S, Antigua – The West Indies Cricket Board on Friday congratulated three legends of Antigua & Barbuda, Leeward Islands and West Indies cricket after they were awarded Knighthoods for their service to the game. President of the WICB, Whycliffe 'Dave' Cameron paid tribute to Sir Anderson Roberts, Sir Richard Richardson and Sir Curtly Ambrose. 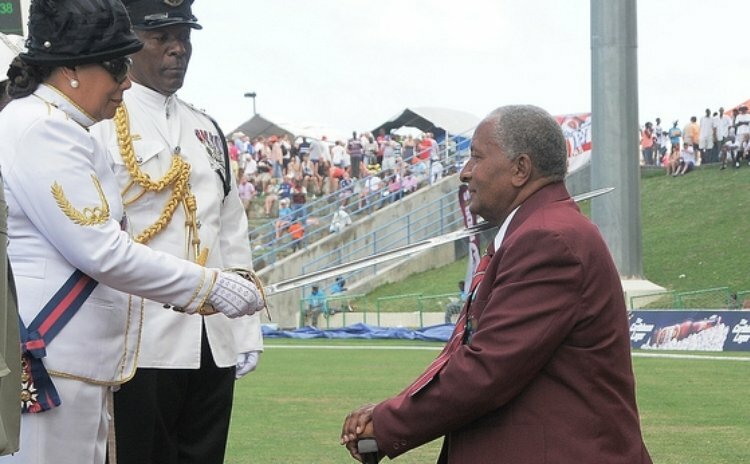 The ceremony took place during the lunch break in the first One-Day International between West Indies and England at the Sir Vivian Richards Cricket Ground with more than 5,000 fans watching. "Today is a great day in West Indies cricket. These three great servants of West Indies have been rewarded for their outstanding contribution to their country, to this region and to world cricket," said Mr Cameron. "On behalf of the WICB, the cricket-loving public of the West Indies and cricket lovers all over the world I want to congratulate Sir Anderson, Sir Richard and Sir Curtly on their knighthoods and also to thank them for all they have done for this great game. We will always remember their outstanding performances, their hard work and loyalty and the entertainment they gave us." Mr Cameron added: "It was fitting that the ceremony was staged on a cricket field which carries the name of another great son of the soil – Sir Vivian Richards. What was also touching was that family members, many supporters and well-wishers were present to witness and participate in another historic day in West Indies cricket." Sir Anderson Roberts became the first Antiguan to play Test cricket when he made his debut against England in Barbados back in 1974. The 63-year-old was an outstanding fast bowler and ended his career with 202 Test wickets at an average of 25.6 runs per wicket. After his playing days were over he contributed to the game as Coach and Selector of the West Indies team and was also President of the Antigua & Barbuda Cricket Association. Sir Richard Richardson was a magnificent stroke-player and played 86 Tests and 224 One-Day Internationals. He made 5,949 runs (average 44.39) in Test and 6,248 (average 33.41) in ODIs. The 52-year-old is the present Manager of the West Indies team. Sir Curtly is rated as one of the greatest bowlers of all time. A giant of a man he took 405 wickets at an average of just 20.9 in 98 Test matches and another 225 in 176 One-Day Internationals. After retiring he entered coaching and is the Bowling Consultant for Combined Campuses & Colleges.